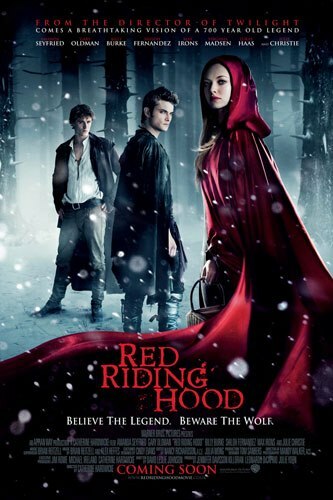 Red Riding Hood tells the story of Valerie (Amanda Seyfried), a young woman who lives in a small village that has fallen victim to The Wolf. Not too long after her sister is killed by The Wolf, a priest (Gary Oldman) is brought to the town to help find and kill the monster. It is then revealed that The Wolf is in fact someone in the village. Soon Valerie finds herself unable to trust anyone. Including the man she’s arranged to marry (Max Irons) and the man she loves (Shiloh Fernandez). Okay, so Red Riding Hood definitely isn’t a full blown horror film. It definitely has a stronger dramatic side, but it does have a few horror elements. The movie incorporates different fairy tales including the obvious Little Red Riding Hood, as well as Peter and the Wolf, The Wolf and the Seven Young Kids, and The Three Little Pigs. Amanda Seyfried shines as our lead girl and has great chemistry with Fernandez. Oldman and Billy Burke (who plays Seyfried’s father) also do very well. This film gets shunned and trashed to no end. In some ways due to the fact that the director directed Twilight. I personally feel Catherine Hardwicke is fine a director with a great vision. RRH has a good whodunit story, some steamy scenes, as well as some breathtaking visuals, thrills, and yes even some good romance. This is by far one of the most underrated films that I know of. I can understand some of the hate for it, but when I saw it I got too caught up in the imagery and the use of the RRH tale to look for the negatives.